Ever since it was approved for construction, the Thirty Meter Telescope has been the subject of controversy. 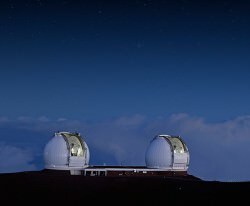 A proposed astronomical observatory that is planned to be built on Mauna Kea – Hawaii’s famous dormant volcano and the home of the Mauna Kea Observatories – the construction of this facility has been delayed multiple times due to resistance from the local community. Stressing the impact the facility will have on local wild life, the associated noise and traffic, and the fact that the proposed site is on land sacred to Hawaii’s indigenous people, there are many locals who have protested the facility’s construction. But after multiple delays, and the cancellation of the facility’s building permits, it appears that public support may be firmly behind the creation of the TMT. Planning for the Thirty Meter Telescope began in 2000, when astronomers began considering the construction of telescopes that measured more than 20 meters in diameter. In time, the University of California and Caltech began conducting a series of studies, which would eventually culminate in the plans for the TMT. Site proposals also began to be considered by the TMT board, which led to the selection of Mauna Kea in 2009. However, after opposition and protests halted construction on three occasions – on Oct. 14th, 2014, then again on April 2th and June 24th of 2015 – the State Supreme Court of Hawaii invalidated the TMT’s building permits. Since that time, multiple polls have been conducted to gauge public support for the project. Whereas a previous one, which was conducting in Oct. 2015, indicated that 59% of Big Island residents supported it (and 39% opposed it) the most recent poll yielded different results. This poll, which was conducted in July of 2016 by Honolulu-based Ward Research, Inc. shows that 60% of Big Island residents now support moving ahead with construction, while 31% remain opposed. While not a huge change, it does indicate that support for the project now outweighs opposition by a 2 to 1 margin since the last time residents were asked, roughly nine months ago. The first poll surveyed 613 Hawaii Big Island residents, aged 18 years and older and from a variety of backgrounds. The most recent poll surveyed 404 Hawaii residents at least 18 years old via both cellphone and landline (with a margin of error of plus or minus 4.9 percent). The recent poll also indicated that the majority of respondents, ranging from 66% to 76%, believe that TMT will provide economic and educational opportunities, and that not moving forward would be bad for the island and its residents. Also of interest was the fact that support for TMT’s construction was split among Indigenous Hawaiians, with 46 percent of those polled in support and 45 percent opposed. What is perhaps most relevant is the fact that while this most-recent poll shows virtually no change in the amount of support, it does show that opposition has decreased. The reason for this is not clear, but according to Kealoha Pisciotta of the Mauna Kea Hui – which is litigating against TMT’s construction – the change is attributable to the PR efforts of TMT, which hired Honolulu-based PR firm to promote their agenda. Pisciotta also stressed that the state Constitution of Hawaii protects the cultural and traditional practices that will be affected by this massive project, which is something residents don’t appear to understand. Faced with the promise of benefits – which includes TMT’s annual $1 million contribution to The Hawaii Island New Knowledge (THINK) Fund, which provides for STEM education. This is not to say that those polled rejected the concerns of those advocating for protection of Hawaiian heritage and culture. In fact, 89% of respondents – the largest return in the poll – indicated that “there should be a way for science and Hawaiian culture to co-exist”. While this is easier said than done, it does show that compromise is the most popular option, and could present a mutually-satisfactory way of moving forward. What’s more, this is hardly the first time that Mauna Kea has been at the center of controversy. Ever since construction began on the Astronomy Precinct in 1967, there has been opposition from environmentalists and the Indigenous community. Not only is the Precinct located on land protected by the Historical Preservation Act of 1966 due to its significance to Hawaiian culture, it is also the habitat of an endangered species of bird (the Palila). Nevertheless, Mauna Kea remains the preferred choice for the location of the TMT, though the board is evaluating alternative sites in case the project cannot move forward. Stone and his colleagues hope to resume construction of the TMT facility by April of 2018, and begin gathering images of the cosmos in the near-ultraviolet to mid-infrared by the 2020s. As the Bad Astronomer has been known to say, “Holy Haleakala!” What an awesome view from the top of Haleakala, a massive shield volcano that forms more than 75% of the Hawaiian island of Maui. Astrophotographer Henry Weiland took this image on July 9, 2013 of his view from “on top of the world.” (He has a self portrait here.) He used a Canon EOS Rebel T3i with an 18-55mm lens. We’re all jealous of your view, Henry!